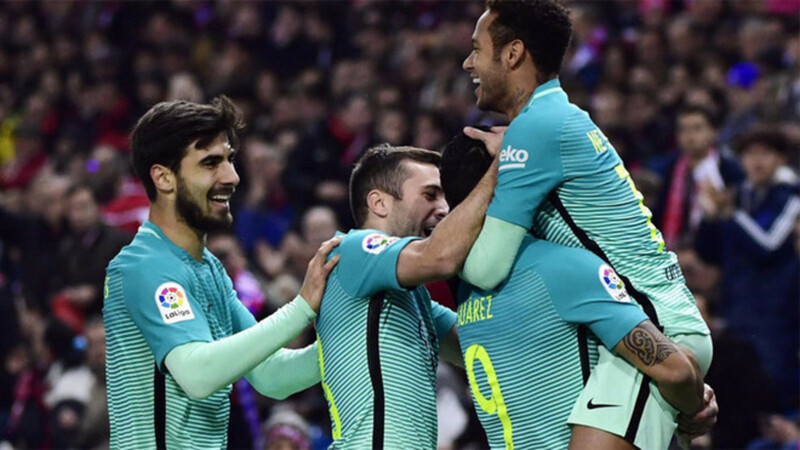 FC Barcelona - 1 : Atletico Madrid - 1 FC Barcelona secured a place in the 2016-17 Copa Del Rey Final with a 1-1 draw against Atletico Madrid at Camp Nou. 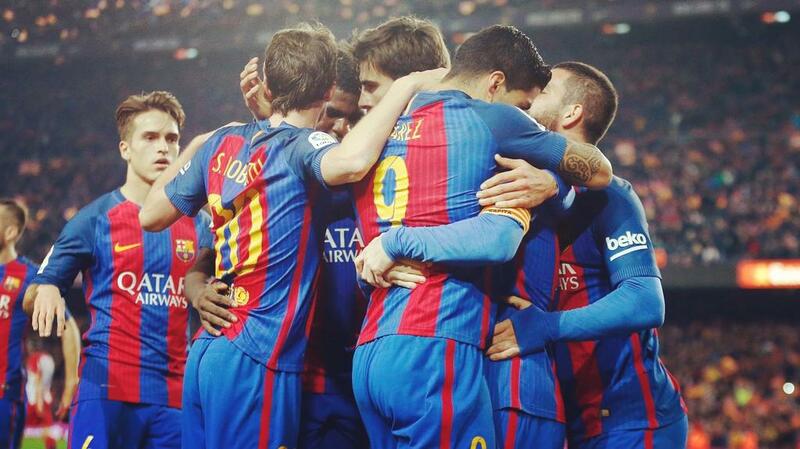 Having won the first leg away from home 2-1, Barca secured qualification with a 3-2 aggregate score. Lionel Messi had the sword of missing the final hanging over his head but instead Luis Saurez, the goal scorer for Barca will be missing the final after he was sent off toward the end of the match. Now Barca await the victor of tonight's Alvaes vs Celta de Vigo match to know the opponent in final. 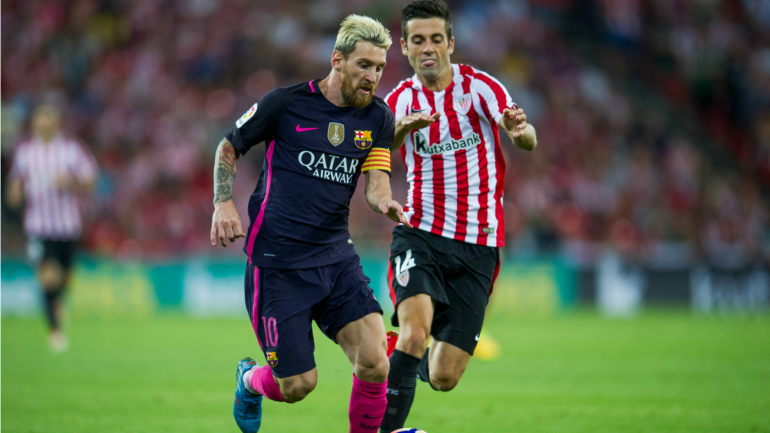 FC Barcelona won against Athletic Bilbao in the League with a 3-0 victory at the Camp Nou. Paco, Messi and Vidal scored for Barca to complete a fairly easy victory. T he first knockout stage of the Champions League is less than a fortnight away, and once again, Barcelona are heavy favourites to lift the “big ears” at the Millennium Stadium in Cardiff come June.However, Luis Enrique’s side haven’t been at their best this season. Their performances have fluctuated from brilliant one day to abysmal the other, hence pinning hopes on Barça winning their fourth Champions League in nine seasons might be a bit premature at this stage. If you are going to place your bets now, it would be prudent to opt to signup via Betting Expert to William Hill or any other bookmaker and take advantage of the best betting bonuses available. Luis Saurez and Lionel Messi helped Barca secure a 2-1 away victory in the first leg of 2016-17 Cope Del Rey semi-final. Enjoy the extended highlights with english commentary. It was one hell of a match with brilliant goal. Do not miss the highlights. Barcelona Football Club took a giant step in securing a place in the final of the Copa Del Rey 2016-17 with a brilliant 2-1 victory against Atletico Madrid away from home. The clash at the Vicente Calderon arena was decided in favour of FC Barcelona by two brilliant goals from Barca's two top scorers this season - Luis Saurez and Lionel Messi. Barca went 2-0 up by around half an hour in to the clock before Greizman reduced the deficit in the second half. The tie is very interestingly poised with Barca in the front street after securing a first leg victory and also two away goal advantage. Barca could afford to lose the return leg 1-0 and still make the final courtesy of those two sensational away goals. The fun part of all it is that Mascherano and Rakitic are awarded the assists for those goals when their contribution was nothing less than minimal. We will come to that later. Goal-line technology, or lack thereof, was the story of Barcelona’s last league outing where they lost ground on league leaders Real Madrid after a 1-1 draw at Real Betis. However, Barça are in a good run of form and lost only once in January in eight games. That loss, though, came against Athletic Bilbao in the first leg of the Copa del Rey quarter-finals. Luis Enrique’s side are the Liga top scorers with 52 goals, but six draws thus far have meant they trail Real Madrid by four points and a game in the title race. This game will be the fourth time this season Barça square off to Athletic, having already won twice and lost once. Lionel Messi and Luis Suárez have combined to score 31 of Barça’s 52 league goals this season. Sergio Busquets, Andrés Iniesta, and Lucas Digne are out injured, while the rest of the squad is available for selection to Enrique.